Intensity is simply a matter of how much effort you put into a given training activity. In other words, how “hard” you are trying. You may already be performing the perfect training activity, but if the intensity is wrong, you won’t get the proper results. After observing many climbers in their natural habitat its clear that intensity levels vary greatly between climbers. Unlike pure aerobic sports (where a good heart rate monitor or power meter can do the trick), intensity in climbing is difficult to quantify, which makes it very difficult to prescribe. It also makes it very hard to get accurate feedback as to whether the proper intensity has been applied. – Base Fitness Training: AKA “ARCing”, the earmark of this training is its LOW intensity. Sounds simple, but this can be one of the most difficult to gauge correctly. Even if you find the right intensity, it can be difficult to keep it up for the long set lengths involved (routinely greater than 30 minutes). The danger of too much intensity is that the effort will become anaerobic, theoretically producing different results than those desired. In my experience most climbers err on the side of too little intensity and I think this is a mistake. These workouts should not be effortless; try to push yourself by climbing on steeper terrain or avoiding the best holds. Avoid vertical (or slabby) terrain and any hands-free rest stances. If you have a heart-rate monitor you might try using it for these workouts to establish a baseline, but don’t assume it will correlate to big-muscle aerobic exercises like running or swimming. If you struggle with finding the right terrain, consider a “Fartlek” style workout, by alternating between periods (Say, 5 minutes or so) of more intense and less intense climbing. Varying the intensity will allow you to give more focus during the intense period and relax a bit or hone technique during the easier interval. During a typical ARC workout, I will keep a pretty good sweat going and will be breathing steadily as you would for a moderate-intensity run or bike ride. – Skill Development: Most technique training should be done in the low intensity range. When new techniques are introduced, the intensity should be very low, but eventually you will need to increase the intensity to “stress-proof” your technique. At some point you will find yourself using these new skills on a limit-level boulder problem or redpoint crux, but you can’t consider yourself a master until you are routinely applying the technique while onsighting at your limit. Usually in such a scenario the intensity will be very high. – Strength Training: This phase can be tricky because its not black or white. Let’s assume that we are following a strength building regimen that involves different “exercises”, each with multiple “sets” of a varying number of “reps”. Each individual “exercise” should be done to failure or very near failure, implying 100% intensity. However, it is unlikely you can achieve failure at the last rep of the last set if you give 100% intensity to each prior rep. Generally your intensity should ramp up as you work through the sets. I generally use 3 sets for a given exercise, so the first set will be around 80% intensity. Not “easy”, requiring attention, but completely in control. I will be fatigued at the end, but I could do more reps if I wanted to. By the third set, I will be breathing heavily, perhaps trembling a bit, my form will just be starting to suffer and I will be giving 100%. For a 5 rep set, by the 3rd rep or so I will have doubts about my ability to complete the set. By the end of the 5th rep I will just about be sliding off the hold. If you’re a screamer, you should be screaming on the 4th & 5th reps. The second set will be somwehere in the middle, starting out controlled and perhaps relatively casual, but will feel very difficult by the end of the set. If this doesn’t sound familiar, increase the resistance until your experience is similar. If you are applying the proper intensity, you won’t be able to handle much more than 20 total sets in a single workout (i.e., 7 exercises with 3 sets each). – Power Training: This one is pretty simple on paper; give 100% or more to each set, once you are properly warmed up (if campusing, your warm-up should inlcude some low, then moderate intensity campusing), then rest however long you need to be able to give 100% again. The tricky part is summoning 100% intensity for a 5-10 second effort. In my experience that is easier to do during a progressive strength training or power endurance routine, where you can gradually dial up the intensity over several minutes. In a true Power scenario, you will need to summon that intensity very quickly. A gradual warmup can help with this, as well as learning how to tap into elevated states of arousel. The cliff notes version: screaming, boisterous encouragement, and aggressive breathing can all help with arousel. Fortunately dynoing can be painful if you aren’t very accurate, and pain will help stimulate arousel as well. Succeeding on every set is a good sign that the intensity is too low. If you’re really attempting the most powerful movements, you should be failing most of the time. Another indicator is number of movements in a single set. True Power or Max Recruitment should trend toward a single extreme movement, but certainly no more than five. In my experience after three movements you can’t really give anything more of value. If you’re doing more than that, and they’re all ‘hard’ moves, then the workout is not really targeting Max Recruitment. As for warming up, while its important to be thorough, be careful not to waste all of your power during your warmup. Power is the first thing to fade during a workout so experiment with different warmup lengths and keep track of what works best (I’ve seen a clear decline in performance when my warmup last more than 45 minutes). Finally, once the warmup is over, there are no easy campus sets. If you can’t give 100% effort then the workout is over. Move on to something else or save it for antoher day. In this example, only the 2nd movement is truly at my limit, the others being mostly window dressing. I’m not a grunter, but I did grunt spontaneously during the hard move. At the end of the day, you’re unlikely to get much out of your training program if you’re just going through the motions. I’ve found myself in this position on many occasions. If you’re scratching your head after a season of ho-hum results, think hard about the effort you put into your training. 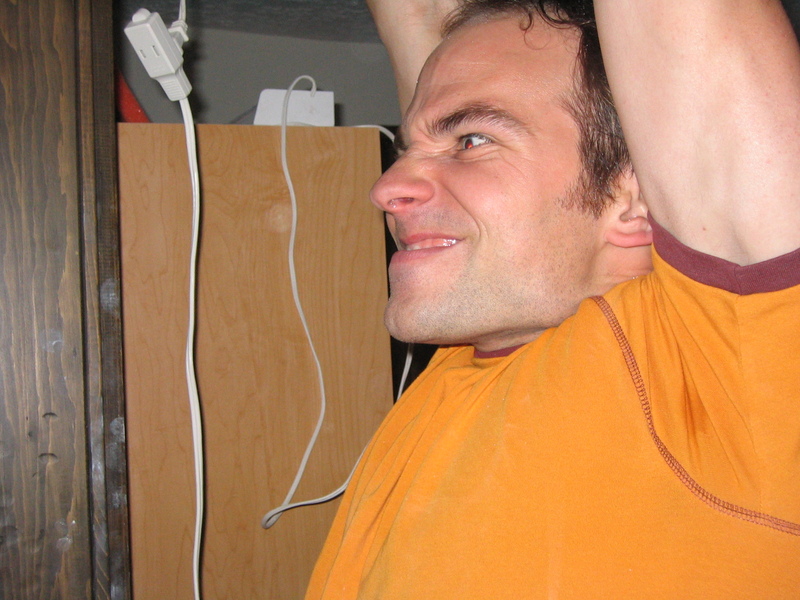 Were you giving it 100% (when 100% effort was called for), or were you mailing it in through your Strength Phase, just counting the workouts until you could start bouldering again? Did you save some strength for the Campus Board during you Power Phase, or did you blow all your power during your so-called warmup? ← What’s Right For You? Question about hangboard strength training intensity. As I’m initially figuring out which weight additions or subtractions I should use on each hold type as a baseline for week 1. I assume I should be looking for a weight that will have me barely able to complete all 7 reps on each position. If I slowly increase weight on week 2 and find I can’t complete reps 5, 6, and 7, should I then continue to increase on week 3 understanding I may not complete all reps, stay the same weight until I can complete all 7 reps, or lower the weight so that I can finish the reps? You should “hold” the weight for the next workout. That means use the same weight until you can complete all the reps (or get close).